Abstract: The importance of network structures for the transmission of knowledge and the diffusion of technological change has been recently emphasized in economic geography. 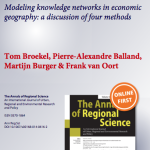 Since network structures drive the innovative and economic performance of actors in regional contexts, it is crucial to explain how networks form and evolve over time and how they facilitate inter-organizational learning and knowledge transfer. The analysis of relational dependent variables, however, requires specific statistical procedures. In this paper, we discuss four different models that have been used in economic geography to explain the spatial context of network structures and their dynamics. First, we review gravity models and their recent extensions and modifications to deal with the specific characteristics of networked (individual level) relations. Second, we discuss the quadratic assignment procedure that has been developed in mathematical sociology for diminishing the bias induced by network dependencies. Third, we present exponential random graph models that not only allow dependence between observations, but also model such network dependencies explicitly. Finally, we deal with dynamic networks, by introducing stochastic actor-oriented models. Strengths and weaknesses of the different approach are discussed together with domains of applicability the geography of innovation studies. This entry was posted in Allgemein and tagged models, networks, paper. Bookmark the permalink.